I am a total bore sometimes. I wish I could tell you that this dessert has a story of sweet childhood memories and stained white little dresses. I wish I could tell you that this dessert has grown on me through the years, reminiscence of a peach tree planted in the courtyard of my grandparents. 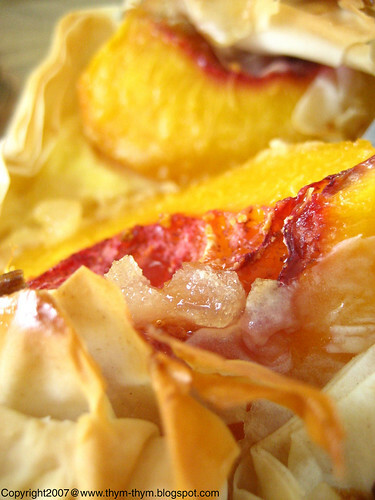 I wish I could tell you that my inspiration came from a trip to south of Spain years ago, sitting on my father’s shoulders and indulging myself to sweet peach tarts. I wish I could tell you that while making this dessert, unicorns were stirring my ricotta, birds were singing at my window and bees were offering me their honey. But I won’t. Because my only excuses behind making this improvised yet delicious dessert were a promise I made, a lazy afternoon and some ripe peaches. I am such a lame. I know. You can boo at me all you want, for now. Because once you’ve tasted my peach parcel with creamy ricotta and fragrant lavender honey, you will start cheering me up and start singing the merits of laziness for generations to come. Using a knife, make an incision on top of each peach. 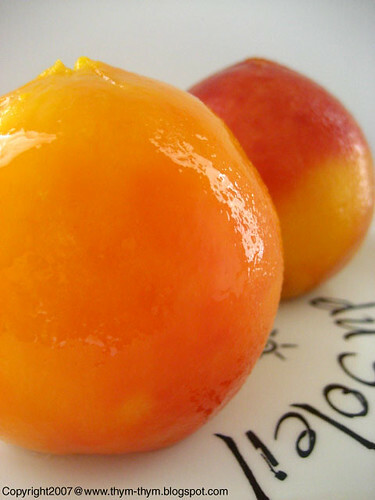 In simmering water, blanch your peaches for only 2 minutes then start peeling off the skin. Cut each peach in quarter and set aside. In a saucepan, put 1 tbsp of honey with lavender pods. Bring to boil then set aside to infuse the honey with the lavender. Using a whisk, mix the ricotta cheese with the remaining honey, the egg yolk and the orange blossom water. Cut 4 small rectangular out of the filo dough, and then process layering (see picture) brushing the dough with butter at each stage. Sprinkle the candied peaches on the peaches and close your parcel by forming any shape you want. Just keep in mind to leave an opening on top of the parcel. Bush with some butter again and drizzle some of the lavender honey on top of each parcel. Sprinkle with some flaked almonds and bake in a preheated 350F oven for about 20 min or until golden brown on top. Serve warm with some lavender pods on each parcel. A l’aide d’un couteau, faites une incision en forme de croix sur chaque peche. Mettre de l’eau a bouillir dans une casserole puis faites blanchir les peches pendant 2 min. Eplucher les peches et couper chacune d’entre elles en quatre. Mettre de cote. Dans une autre casserole, mettre une c.s de miel avec les fleurs de lavande et des que le miel commence a bouillir, retirer- le du feu et laisser de cote pour infuser. A l’aide d’un foeut, melanger la ricotta avec le reste de miel, le jaune d’oeuf, et l’eau de fleur d’oranger. Couper 4 petits rectangles de votre pate a filo, puis commencer a monter votre dessert (voir photo) en badigeonnant de beurre fondu a chaque etape. Parsemer quelques morceaux de gingembre confit sur chaque peche et fermer votre petit rectangle sous la forme que vous desirer. N’oubliez seulement pas de laisser une petite ouverture au sommet de chaque portion. Badigonner de beurre fondu toute la surface de la pate a filo, Verser une peu du miel parfume a la lavande sur chauqe portion et saupoudrer d’amandes effilees. Faites cuire dans un four prechauffe a 180C pendant 20 min ou jusqu’a ce que la surface soit bien doree. Servir a temperature ambiante saupoudrer de quelques fleurs de lavande sur chaque croustillant. I don't mind if there is not a story behind this dessert - I'll take dessert anytime, story or not!! I'm singing just looking at the photos! Simply love peaches and simple is always good for them. Lavender honey . . . ummmmm. Story, peaches and all. This looks lovely actually it looks insanely lovely. Yummy! So pretty and delicious! Rose, I am dying to try this. How I wish I could have tried it! It looks delicious! With drool-inducing photography like that, who needs a story?!? Beautiful! I love to keep peaches so simple like this because there's no need to do fancy things...they're amazing on their own! 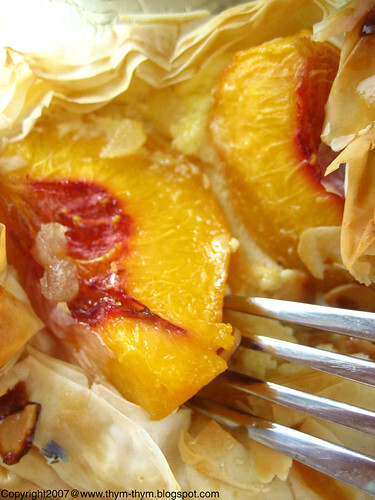 Rose, what a delicious way of having peaches for dessert - love all the ingredients you used. -Deborah: Thank you very much. You should really try it. It's easy and so good. -Tanna: you are so sweet Tanna. You are right, with peaches that sweet you don't wanna spoil them with heavy desserts. - Thank you very much Meeta. It was indeed delicious. - Thank you Anh. Let me know how it went if you do try it. - Ivonne, that's so nice of you. - Thank you very Dolores. - Nan, you are absolutely right. Thanks for stopping by. - Claude, C'est pas de la paresse dont tu en as besoin c'est des vacances. - Patricia, the ingredients worked so well together with the peaches, I was impressed myself. Mmm, they look so light and delicate, pretty too! I love your story about there not being a story. Quite clever. :) Your dessert is simply lovely and beautifully shot. That looks deliciously perfect. 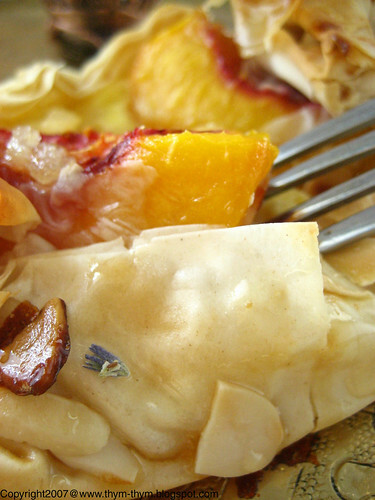 The contrast of the crispiness of the filo pastry with the luscious peaches and creamy ricotta. And a nice twist with the lavender (which I am addicted to, by the way). I will have to bookmark this for stone-fruit season. - Thanks Kelly-Jane. They were indeed light and delicious. - That's very nice of you Susan. Thanks for stopping by. - Nora, It sounds like you were with me, eating the dessert. The lavender adds a nice warming touch to the peaches that I love. - Thankc for your nice comment Lucy. Oh that just looks amazing and luscious.